Say goodbye to back pain and hello to Tower Docks. The Tower Dock is the ultimate in Pole Dock designs. 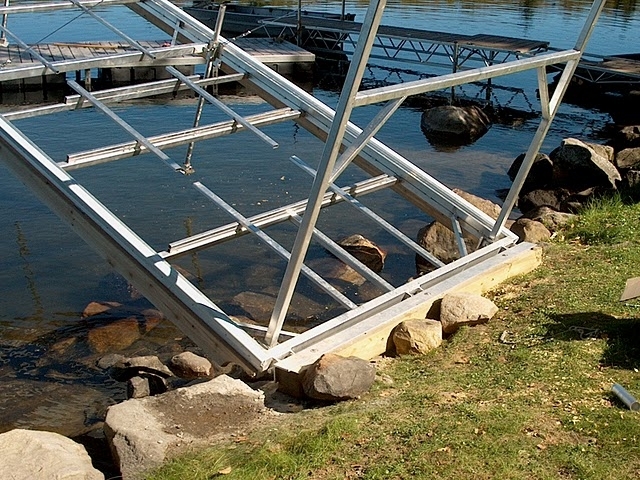 Suitable for many of the same conditions as a Pole Dock, a Tower Dock has the added benefit of lifting out of the water like a drawbridge at the end of the season. No more getting wet with the annual install and pull out! The tower component is built right into the frame so there are no heavy components to store away, and the tower folds underneath the decking in the summer leaving your dock clean and ready for use. Tower Dock Installations are somewhat custom based on your shoreline. A site inspection is usually performed during the quote stage to ensure you get everything you need to make your new Tower Dock last a lifetime.